Habits are hard to break: Just when you think you're firmly in control, you backslide again. Such may be the case with Americans debt addiction. 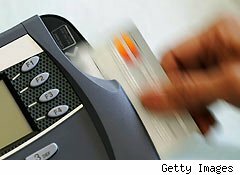 According to CardHub.com's, Q2 2011 Credit Card Debt Study, U.S. consumers accumulated a staggering $18.4 billion in credit card debt in the second quarter -- 66% more than they accumulated in the same quarter a year ago, and 368% more than in the second quarter of 2009. Based on the study, Americans will end 2011 with around $54 billion more in credit card debt than they began the year with. "A debt increase of $18.4 billion during a single quarter is mind boggling, especially when you consider that this increase is 368% higher than what we witnessed in the same quarter two years ago," says Odysseas Papadimitriou, CEO of CardHub.com.com. The study focused on consumer debt data from the Federal Reserve's G19 report in conjunction with quarterly charge-off data to determine how much consumer debt actually increased when you consider the amount of bad debt written off the books. The upside is that consumers ended the first quarter of this year with a significant net decrease in credit card debt -- as they had in the first quarter of 2010. However, in subsequent quarters last year, they proceeded to wipe out that reduction. "There is no doubt in my mind that a lot of consumers are reverting back to pre-recession habits and that this is why we are witnessing such a dramatic increase in credit card debt (net of charge-offs). Anyone whose income was tied to the housing boom -- either directly or indirectly -- should realize that those years aren't coming back unless we find ourselves in another bubble," says Papadimitriou. Also troubling, say the folks at CardHub.com, is that in 2011, people seem to be spending up their debt at a faster rate than ever. Last year ended with a net increase in debt of $9.1 billion, which practically erased the net decrease of $10 billion in 2009. In contrast, 2011's projected $54 billion increase in debt is hair raising. To be fair, he says, part of the increase is also driven by consumers who lived within their means before the Great Recession, did not see income reductions when the housing bubble burst, and are now increasing spending because of growing optimism about the economy. That's a healthy sign. "Without being able to quantify this, my assessment is that the majority of the increase is attributed to the failure of many to realize that their disposable incomes will not be going back to "bubble levels" anytime soon," says Papadimitriou. What does all this mean for our seesawing economy? "Our economy is in this state because a significant number of consumers wanted to overleverage themselves and regulators allowed this to take place, primarily through the housing bubble. While a trend that points to consumers reverting back to pre-recession debt levels could be construed as a sign that things are returning to 'normal', I believe it is worrisome indicator of a return to overleverage," says Papadimitriiou. He says there are three clear takeaways from the study. 1. Without a doubt, people are much more confident about the nation's financial outlook and that more people are finding jobs (even if it is part-time). 2. Consumers are recognizing that credit cards are now safer vehicles for revolving debt, thanks to the new credit card law, which prevents issuers from arbitrarily changing a consumer's interest rate on an existing balance. 3. Some consumers simply have not come to terms with the fact that they shouldn't return to their pre-recession spending habits, no matter how much the economy recovers. Consumers need to think strategically: Maintain an excellent credit standing, ensure that you have the income to comfortably pay off any new debt, and buy items on credit only when you will be better off financially by getting them now as opposed to buying them later with cash -- for example, buying a home instead of spending the same amount of money in rent,or buying equipment for your small business that will increase revenue. Instead of increasing your overall debt load, focus on lowering the cost of your existing debt, he says. For example, there are some amazing 0% balance-transfer credit card offers available now that, in combination with the new credit card law, can help consumers lower the cost of their existing debt without having to worry about "gotcha" practices, says Papadimitriou. Mostly, he says, we should learn from our mistakes.